Somebody, somewhere, somehow calculated the odds of completing a perfect NCAA tournament bracket at 1 in 9.2 quintillion. A quintillion is a billion billion, or 1 followed by 18 zeroes. Numerically represented, the odds of perfection are 1 in 9,200,000,000,000,000,000. At the other end of the spectrum, one ESPN bracket challenge entrant managed to achieve a different kind of perfection — going 0-20 in the first 20 games. Alas, his or her bid for reverse perfection went awry when Nevada beat Texas. The NCAA tournament is a fun time for both serious and casual sports fans, and I think it’s a good thing for the country, too. In a country as large and diverse as America, there aren’t many unifying events, but the NCAA tournament, and the submission of office pools and pick sheets, is one of them. Just don’t expect perfection. When Kish and I lived in D.C., I don’t think we ever made it to the Maryland side of the Potomac River. We we went to the Virginia side all the time, in Alexandria, and Arlington, and at Mount Vernon. But the Maryland side seemed like No Man’s Land. Now I’ve finally made it, for work-related meetings. The meetings are in one of those massive, sprawling convention centers that is like a city within a city. It’s got a nice waterfront path, a big Ferris Wheel, a water taxi, and a fine view of a bridge leading to the Virginia side. And, it’s right on the landing path for Reagan National Airport, with planes descending about every two minutes. So, this is the other side of the river, eh? Who knows? Maybe if I look hard enough I’ll find the silver dollar George Washington supposedly threw across the Potomac. This week there were gubernatorial elections in New Jersey and Virginia. Voters went to the polls, cast their ballots, and there were winners and losers. Right? Not so fast! Apparently the number of actual votes received by candidates don’t tell the real story — at least, according to the losing party. In New Jersey, Republican Chris Christie won a crushing victory in a traditionally Democratic state. Yes, but, the Democrats say, Christie is not a Tea Party Republican and the vote for him actually should be interpreted as a rebuke to Tea Party extremism. In Virginia, Democrat Terry McAuliffe took back a governorship that had been in the hands of the GOP. Yes, but, the Republicans say, his opponent turned an apparent landslide into a close contest in the weeks after the problems with the Affordable Care Act hit the news, and the vote really should be seen as a repudiation of “Obamacare.” It’s silly, of course, to try to extrapolate the results of state elections, which often turn on state-specific scandals and superstorms, into some kind of national Rorschach test. Clearly, though, nobody apparently accepts a loss as a loss anymore; every bad election result just provides a platform for spin, excuses, and sketchy rationalizations. It’s one thing to take that approach with election results, but quite another to apply it to functioning government programs. Republicans see the troubled Healthcare.gov website as yet another example of catastrophic governmental hubris and ineptitude, Democrats say Republicans should accept some of the blame because they have stoutly opposed the Affordable Care Act at every turn. The parties have radically different views of the meaning of governmental debt, whether the economy is performing poorly or well, what constitutes poverty or need for governmental assistance, and countless other topics. We’re hours into the election coverage, and the results are on the razor’s edge. The President leads and looks like he may well win the Electoral College tally, but Mitt Romney remains within striking distance if the cards fall his way. States have been called as predicted, and other states — those damnable “Battleground States,” like Florida and Virginia and oh-so-fickle Ohio, that swing from party to party from election to election and delight in confounding the experts — are too close to call. Interesting, isn’t it? This vast country, with such diversity, geographical and demographical, sends millions of people to the polls over a vast area thousands of miles across, and the election nevertheless remains excruciatingly close. There will be a winner and there will be a loser, but is there really a message? With such a close election, after months of campaigning and billions of dollars spent, we are left to ask: What does this election really mean? Yesterday Kish and I went exploring the area around the Homestead and ended up at the Bath County Courthouse in Warm Springs, Virginia. 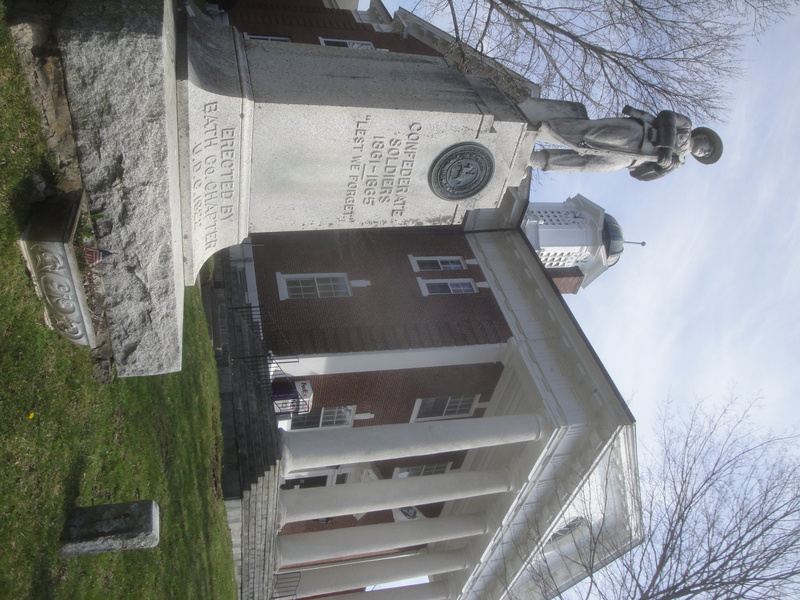 I guess I should have expected to see a monument to Confederate soldiers on courthouse square, just as you see monuments to Union soldiers on courthouse lawns in Ohio. Still, it was a bit jarring for a lifelong Northerner like me to see the statue, with the inscription “Lest We Forget” — erected in 1922, more than 60 years after the Civil War began. What was it, I wonder, that the people of Bath County of that day wanted to remember about that terrible conflict? It’s spring break again at the Columbus Academy. 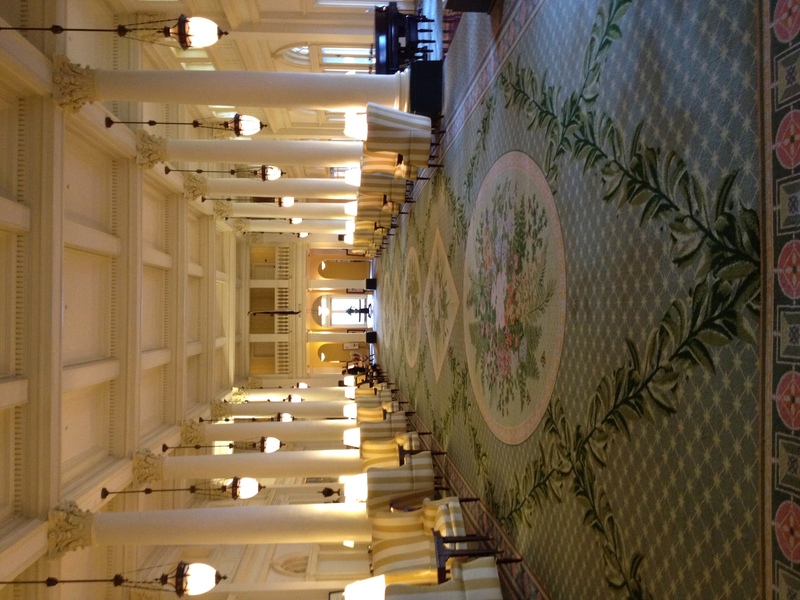 Last year, we decided to visit the Greenbrier for the first time. This year, we’re checking out the Homestead. The Greenbrier is in West Virginia and the Homestead is in Virginia, and the Homestead is a bit farther away from Columbus than the Greenbrier, but people tend to think of them together. There’s a reason for that. Both have the same historical feel, both started as resorts because of proximity to sulphur water, and both have the same impressive outside appearance and the same huge and beautifully decorated common rooms — at least, the ones we’ve seen so far. We’ll be doing some exploring of the hotel and grounds, but right now we need to find a pub that is showing the NCAA games and get ready for some March Madness, Homestead style.